India, after witnessing spectacular growth averaging above 9 percent over the past decade, has started to slow in the last few years. The slump in infrastructure and corporate investment has been the single biggest contributor to India’s recent growth slowdown. India’s investment growth, averaging above 12 percent during the last decade fell to less than one percent in the last two years. What is especially worrisome is that more and more investment projects are getting delayed and shelved, while the pipeline of new projects has become exceptionally thin. This slowdown has sparked an intense public debate about its causes. Some commentators, including representatives of the business community, argue that high interest rates, which raise financing costs, are the major culprit, dampening investment. Others maintain that interest rates are only partly responsible for the current weak levels of investment, suggesting that a host of other factors, particularly on the supply side, are at play. Our new Working Paper seeks to shed some light on the reasons behind this investment malaise. Using a novel index of economic policy uncertainty—an innovation in our analysis—we find that heightened uncertainty regarding the future course of broader economic policies and deteriorating business confidence have played a significant role in the recent investment slowdown. How much of the investment slowdown can be attributed to higher interest rates? We analyzed the connection between interest rates and the investment slowdown, based on a simple investment model that takes into account demand and business confidence indicators, as well as the financing cost of investments. We find some striking findings. Real interest rates account for only one quarter of the explained investment slowdown. Further, macroeconomic and financial variables (interest rates, external demand, relative prices, global financial market volatility etc) alone cannot fully explain the weakness in investment. Rising policy uncertainty. In particular, high profile tax policy decisions announced in the 2012/13 Budget reduced foreign investors’ interest in India, while the increasing difficulty of obtaining land use and environmental permits raised regulatory uncertainty for infrastructure and other large-scale projects. Delayed project approvals and implementation. As a reaction to high-profile governance scandals, project approvals, clearances, and implementation slowed sharply. Supply bottlenecks are particularly pronounced in miningand power, with attendant consequences for the broader economy, especially manufacturing. How do we pin down the impact of economic policy and regulatory uncertainty? We rely on a novel measure of policy-related economic uncertainty for India developed and constructed by several Stanford University economists. The application of this index provides an important advancement in quantifying policy uncertainty. The overall Economic Policy Uncertainty (EPU) measure combines two types of underlying information (see chart). The first component quantifies newspaper coverage of economic policy uncertainty, including regulatory, fiscal and monetary policies uncertainties. The second component combines measures of disagreement among major economic forecasters regarding key macroeconomic variables, namely near-term inflation and the federal government budget deficit. After controlling for economic policy uncertainty, our results show that that financing costs do not appear to be a critical factor in explaining the decline in new investments. Heightened uncertainty and deteriorating business confidence have played a key role in the decline in new investments and postponement and cancellation of others. In other words, these results confirm what is perhaps intuitively obvious—clarity in terms of future policy is critical for a pick up in investment and to ensuring that projects underway are completed. 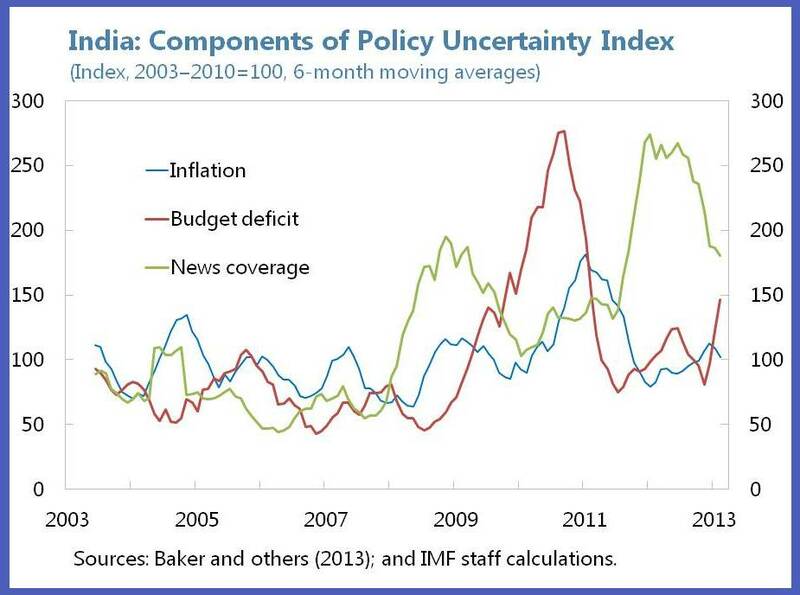 Further, the current level of economic policy uncertainty exceeds its post-Lehman highs, suggesting that uncertainty is primarily driven by India’s domestic policy challenges, and not by global uncertainty factors such as the withdrawal of unconventional monetary policy in advanced market economies. What does this mean for policy? The IMF’s 2014 annual review on India suggests that continued progress on key structural reforms, including power sector reforms, easing labor restrictions, and enhancing health and education outcomes would help improve the business climate and domestic investment. The Indian authorities have taken a number of steps over the last year to address structural issues, including passage of some long-awaited legislative measures. Most importantly, the Government of India has set up a Cabinet Committee on Investment (CCI) as well as a Project Monitoring Group (PMG), to fast track stalled large-scale investment projects. The fact that the CCI has cleared investment projects worth about 5 percent of GDP since its inception in January 2013 is an encouraging development. As cleared projects are implemented and remaining uncertainties and bottlenecks are removed, investment activity is likely to pick up, paving the way for revitalizing robust and inclusive economic growth in India.